Tired of your overgrown garden? If you're going to be spending a lot of time whipping it into shape, a decent pair of garden shears is going to be handy at some point. Whether taming an unruly rose bush or chopping off rogue tree branches, something sharp in the toolbox is essential. Garden shears fit the bill, perfectly. 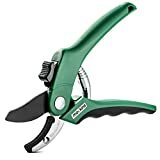 From harvesting herbs or tomatoes from the vine to shaping and pruning perennial plants, garden shears are heavily used tools. But what to choose? If you're new to gardening, picking a pair of garden shears can be tricky. Garden shears are just large scissors made for cutting plants. They do have a few great features though that increase their usability. There are a few things to consider when picking a pair of shears. Someone with a lot of thick branches to cut might want a heavy-duty pair of shears, for example. If they're looking to deadhead some blooms, they might opt for a less cumbersome alternative. We have outlined some things to think about before you make a decision. If you have a spacious garden and you know you'll be using your shears a lot, it makes sense to get a pair that will last. Professional grade garden shears are an excellent choice because they're durable, ergonomic, and sharp. For smaller gardens or a lighter workload, the professional shears might be too cumbersome and expensive. Take a look at your garden and think about what you need your shears for. It will make your shopping easier. If you have a tool shed or garage, a big pair of garden shears won't be a storage issue. However, if you're keeping your tools inside your house or apartment, you might want something smaller. Plenty of compact garden shears are still sharp enough to get the job done – they may just need a bit more ummpphhhh. If you're hoping to tackle tree branches, a pair of shears with long handles might be necessary. Another thing to factor in is your hand size. If you have small hands, you can find specially designed garden shears out there for you. Intended usage factors heavily in this area. If you're going to be using your garden shears a lot, it might be an idea to pick ones that won't fatigue your hands and arms. Heavy, long-handled shears for trees will be okay if you're not planning to prune an entire orchard with them. 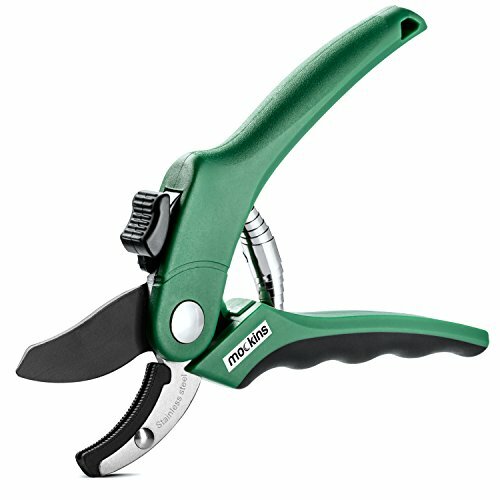 If you've got a lot of hedges to tackle, a mid- to light-weight pair of pruning shears might be the better choice. Garden shears tend to have a lot of moving parts that may wear out over time. Some models have easily replaceable parts. Avoiding the necessity of having to buy a new pair every time something wears out is a bonus. Parts for brands like Felco are widely available, making it easy to replace parts as needed. Repairing is often more cost effective. As with most things, the price of garden shears varies widely. A small pair of is usually under $10 on Amazon, while a pair of Felco 2 shears ​can be anywhere up to $50. The professional-grade tools tend to be on the pricier side, but that's unsurprising. Figuring out your other criteria will help narrow the price range down. 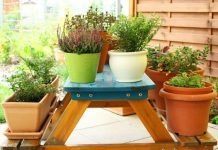 If you're the kind of person who likes to get a good look at things before you buy, you're better off heading to your local garden center or hardware store. Otherwise, a broad choice of garden shears is available online. Online retailers often offer free delivery over a certain amount, and free returns if you don't love what you get. A couple of brands pop up often when searching for garden shears. Fiskars, Felco, Corona, and Gardenite all offer a broad range of shears and pruners that suit different needs. Their price points are about average, and they all have great customer feedback. Amazon's top five best-sellers include two Fiskars models, two Gonicc models, and a pair of VIVOSUN shears. Bypass pruners seem to be the most popular type of garden shears. These have two curved blades that bypass each other, not dissimilar to a pair of scissors. People like them because the blades give a nice clean cut. You'll also see anvil and ratchet pruners pop up. Anvil pruners have a cutting motion more like a knife and are suitable for tough cuts like thick branches or dead wood. Ratchet pruners cut in stages and might be better for people with smaller hands or those prone to wrist strain. Online retailers like Amazon offer a wide range of garden shears. They also have a solid reviewing system, so you can read through and get honest customer opinions. Home Depot and Gardener's Supply Company are also good retailers to check out. These three often have special offers and free shipping, too. Otherwise, your local garden center or hardware store should also have a decent range. An advantage of brick and mortar stores is that you can also chat with the associates. They are often very knowledgeable and eager to help in selecting the right tools for you. In researching garden shears, we had to narrow our favorites down. Based on our criteria, we've picked our top five garden shears to help you get some ideas. We looked at technical aspects such as ergonomics and blade quality. Our review also included practical elements like the availability of replacement parts and how easy they are to clean. Lastly, we also factored in customer satisfaction and price. We used Amazon star ratings here, which were current at the time of writing but may vary slightly in the future. 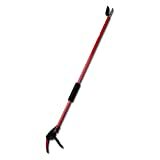 This handy tool is great for hard to reach plants or for snipping off rogue tree branches. The high-carbon steel blade is fully treated, replaceable, and has a non-stick coating for smooth cuts. Dimensions: 7.37W x 1.93D x 46H in. With 4.5 stars on Amazon from 487 reviews, customers have been pretty happy with this product. The main drawback seems to be that although the description says it can cut up to 1/2" thickness, a couple of reviews mention having difficulty cutting anything that thick. The Mockins anvil shears are a good alternative if you don't like the sound of bypass shears. The handles are comfortable and suitable for those of you with small hands. The stainless steel blades cut cleanly, but replacement parts are a little tricky to find. At $8.99 and with a lifetime warranty, they're a pretty inexpensive option. A very good choice if you're not doing anything too heavy-duty. Customers also seem to be happy with their purchase – they have a 4.5 star Amazon rating from 243 reviews. 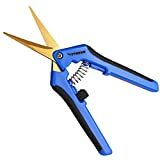 VIVOSUN's hand pruners are great for light garden work. 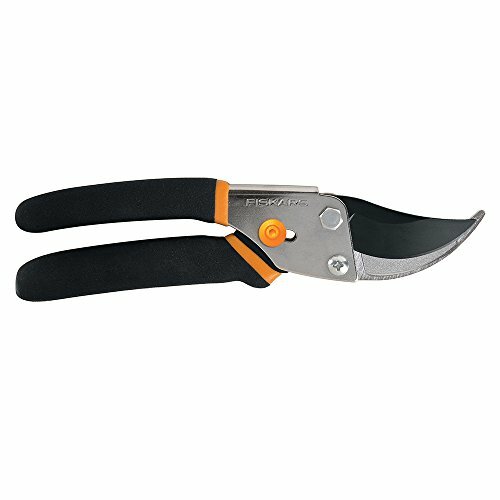 The small, curved blades are ideal for precision cutting – deadheading, minor hedge trimming, and other small tasks. We don't recommend these for serious yard work, but they make a nice addition to the toolbox. Also boasting 4.5 stars on Amazon, 495 reviews, and a neat price from $12.66. There is not too much that can go wrong with these. This one is the top pick for the guys over at Wirecutter. While we agree with their assessment, we marked it down a spot because of the price. 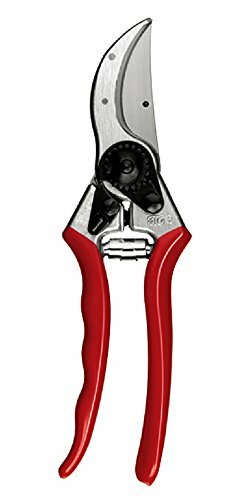 These pruners are around $49.90, which is a pretty steep price. On the other hand, they do tick all the boxes. The blades are durable, they cut cleanly, and Felco parts are super easy to find. You can also sharpen them, which is very convenient. The 4.5 star rating on Amazon from 1,103 reviews shows that customers are happy with them too. For quality and price, we love these Fiskars All Steel Bypass Pruning Shears! 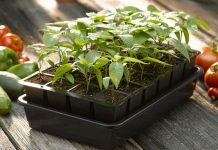 They're good for general garden use, particularly for trimming stems and light branches. The blades are fully hardened, precision-ground steel, which helps them stay sharper longer that other blades. Fiskars also coats them, which stops them from getting stuck together from tree sap. 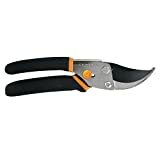 They come with a lifetime warranty and are very affordable, at With 4.5 stars on Amazon out of 2,409 reviews, customer satisfaction is top with this pair of shears. We can't emphasize enough how important it is to assess your garden needs before making a decision. If you know your shears are going to be working overtime, it's best to invest in something heavy-duty or professional grade. For gardens that need a lot of work, the Felco F-2s are a good bet. They're super sturdy and easy to maintain. The price tag is a heavy one, but worth the money. If you're not sure what you'll need, we recommend the Fiskars All Steel Bypass Pruning Shears. These shears are multipurpose and will be great for most garden tasks. Using these will give you a better idea of what kind of shears will be most suitable for your garden. If you're finding them a bit weak for branches and dead wood, go for something heavier. Harder to reach spots will require shears with longer handles, such as the Corona Long Reach Pruner. These get rid of the need for a ladder, which is safer in the long run. They're handy and easy to use. We hope that you found our review helpful in selecting the right garden shears for your toolbox. Let us know in the comments if there are other products you would like us to review.